Kirani James continues to do us so proud! Moreover, I am pleased that the authorities — at every turn — do not allow his performances to go unnoticed. 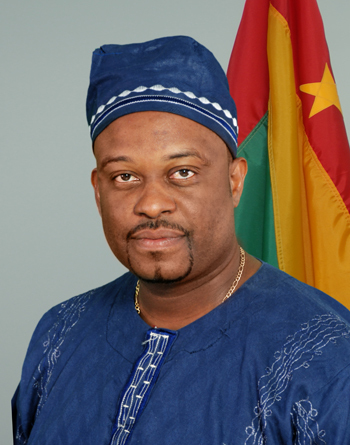 The Prime Minister, in his last national address, did so; as well as did Minister of Sport Emmalin Pierre, who has consistently applauded the efforts of Kirani, on behalf of the government and people of Grenada. The opposition for its part, through Patrick Simmons whose sporting credentials and love for sports are undeniable, has recently repeated that the athletic stadium currently undergoing refurbishment should be renamed after Kirani. Grenadians, of all walks of life, have aired that or similar views, as we are all so proud of Kirani; we want to give him the best reward we can. However, I want us to shift the discussion somewhat. I am of the considered view, that Kirani is established as an international track athlete. He will win more world championships, more gold medals; and, when he breaks Michael Johnson 400-meter record, we might have to name the airstrip, at Maurice Bishop International Airport, after him. What concerns me, though, is what are we doing to produce the next world-class sportsman or woman in track or any other sporting discipline? This, to me, is the real challenge and the topic for national discussion. For me the novelty of Kirani — a poor fellar from the small island ‎of Grenada becoming a champion global athlete — is over. The world has heard about us. But, who is next? Who else do we have worthy of making the world stand up and take notice of us? And, when? What structures and funding are we putting in place to win on the world stage again? I have not heard of Rondell Bartholomew in a while. Has he recovered from his injury? Is he back in training? It will be nice for someone to enlighten the nation on Rondell. It was not so long ago we expected him and Kirani to be coming first and second, in these big races. He would have kept Kirani good company. Let us not forget the story in the Bible about the shepherd and the lost sheep. I remember from my time in government, then Minister of Sports Patrick Simmons‎ was developing an elite athletes’ and coaching programme. What is the status of that programme? The idea was to identify the talented athletes and get them to work with the leading coaches on the island in their respective discipline. I hope that this programme is up and running efficiently. It is such focused programmes that will ensure our talented young people get a real chance of maximizing their potential. However, this approach must not end with athletics. There must be a structured and focused programme for each and every sporting discipline. ‎Let us take swimming, for example; the 2013 Sportswoman of the Year Oreoluwa Cherebin continues to excel. But, what’s next for her after Carifta? I am of the view that the state should pay for her to attend a top university, with a recognized and respected swimming programme. If the state can secure her a scholarship, then fine; but, her career should not be left to chance. I must make the point, as well, that while we are outstanding in swimming, swimming is already an urban elitist sport. There is no pool for children in the rural areas to learn to race, and the lessons in St George’s are expensive; prohibitive for “poor people’’ children. This must be addressed immediately; at least, a pool should be constructed in the St Patrick/St Andrew area, so that children from communities in those parishes can have access to the sport of swimming. Furthermore, it should be done before the planned Olympic-size pool is built in the St George’s area. I know persons involved in swimming may be upset with my view; but I maintain there is a bigger vision to the sport than just children from the St George’s schools representing Grenada. West coast children are natural with water and they need a fair chance as well. A similar situation exists in the sport of lawn tennis, with the only quality facility in St George’s. I urge the Sports Minister to build, or refurbish, at least one tennis court ‎in each parish, including Carriacou; this way, we can further promote tennis and make it more accessible. Tennis is no bourgeois sport. It is cheaper to play tennis than cricket. However, we need to develop a strategy for developing the sport. Every village has a basketball court, not because we have had any NBA player coming from Grenada, but because young persons were jumping hoops on every lamppost, until politicians saw the political need to promise, in every campaign, a court for every village. While on basketball, let me offer two perspectives: One is, that basketball, volleyball and netball need a modern indoor facility; with first-class wood surface to bring out the best in our players. The current hard courts are good for the “sweat’’; but, if we are to go to the next level in 2015 and beyond, we need to invest in a modern facility. Second, more emphasis needs to be given to some of the sporting discipline that are fading away, like table tennis and cycling. Some of the weaker associations require serious support from government, in terms of institutional strengthening and resources. Congratulations to our footballers on their recent victory against Puerto Rico. While we celebrate, the discussion should shift to, how many of our footballers can we develop to play at the professional level? Winning an occasional game is great. There is no distracting from that achievement. However, we need to develop our footballers so that they can go on to earn a living with their talent; and, here, I am not speaking about the small professional leagues in the Caribbean region. I am thinking about the MLS in North America and the leagues around Europe. Our boys have the ability to play in the European and North American leagues. Is that the vision of the Grenada Football Association, though? So, let us discuss how we can develop our human sporting capital to world-class level. Let us show the world that Kirani James is not an exception.